This post is sponsored by Balsam Hill. All opinions are my own. Spring is the perfect time to spruce up your surroundings… starting with your front door. 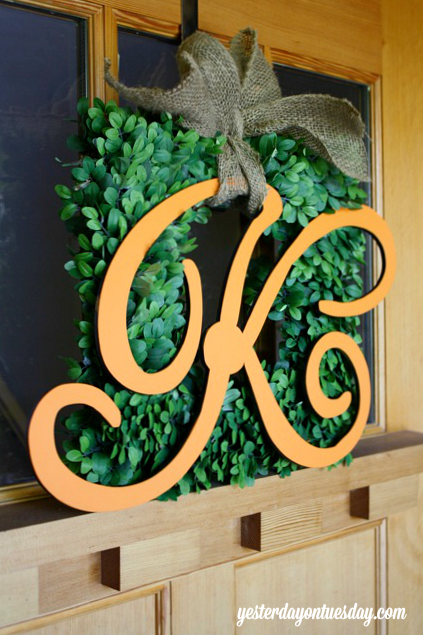 Nothing sets the stage for a pretty entryway like a wreath. Balsam Hill is my go-to place for fabulous spring wreaths. 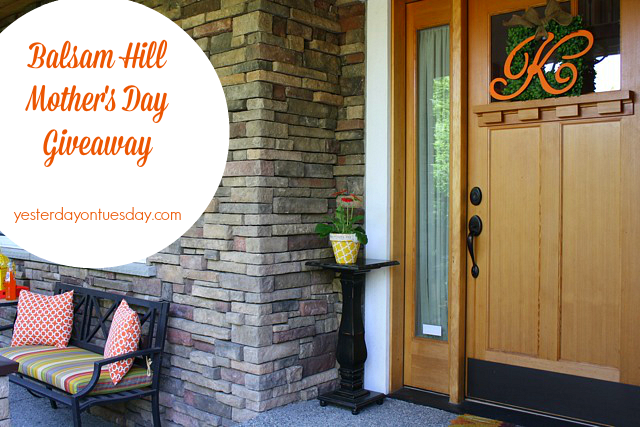 I had so much fun choosing the perfect Balsam Hill English Boxwood wreath, and shopping on Etsy to create a springy Mother’s Day inspired doorstep/entry for my home. And the best news is… Balsam Hill will also give one of my lucky readers their own English Boxwood wreath as well as a $100 gift card to Etsy so they can freshen up their space! 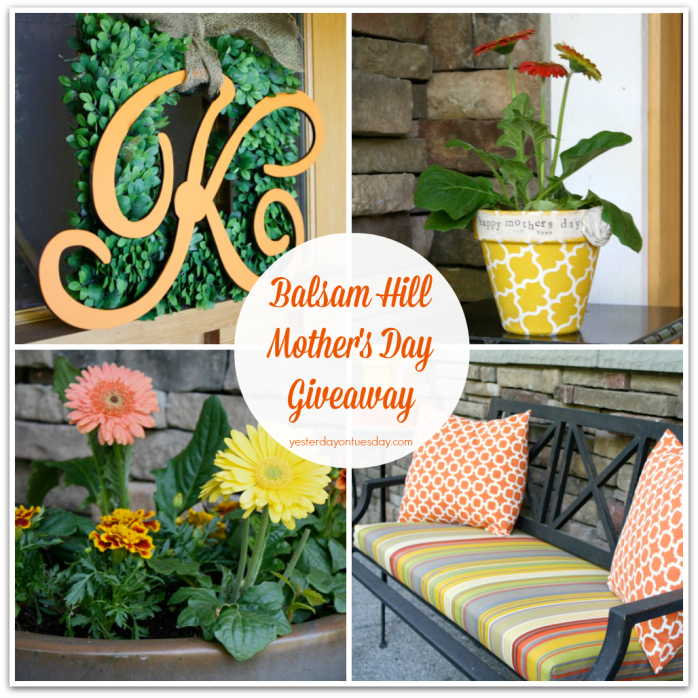 But wait, there’s more: Balsam Hill is running an additional giveaway where you can score TWO wreaths and TWO $100 gift cards to Etsy on their Balsam Hill Blog. Check it out! That’s right, there are TWO chances to win BIG! I’ll get to the my giveaway details soon. 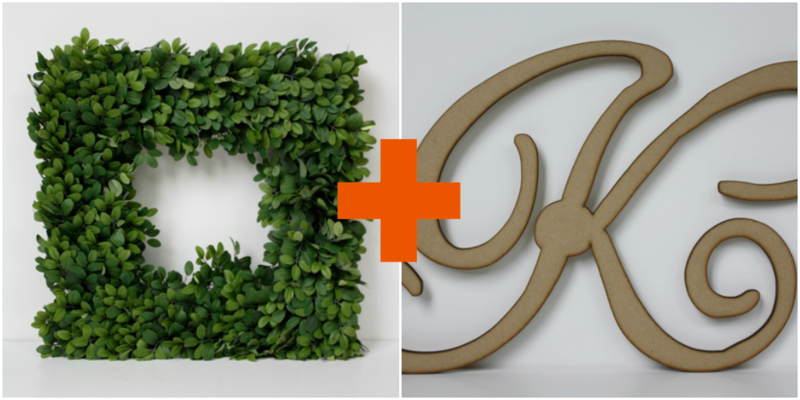 First, let me show you how I personalized my Balsam Hill Spring Boxwood Wreath. 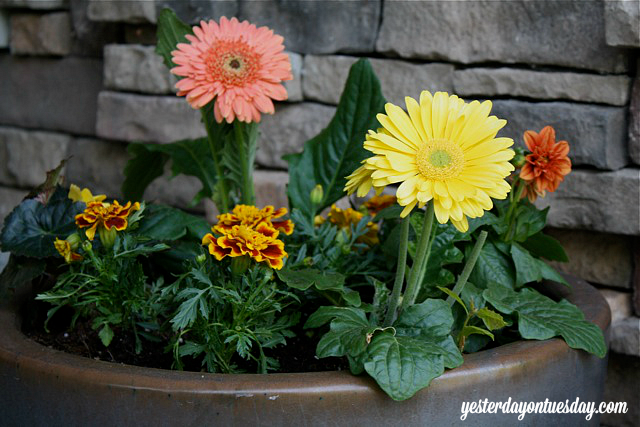 Now that spring has sprung, I find myself inspired by bright citrus colors like green, yellow and orange. The lovely green color of this English Boxwood wreath made it the perfect choice for me. It look great wreath without anything! It’s so modern and clean looking. But since it’s spring and I’m feeling springy, I decided to buy a large wooden letter from Etsy seller Buildeez and paint it orange. Balsam Hill generously gave me an Etsy gift card so I could score a few items to complete the look. 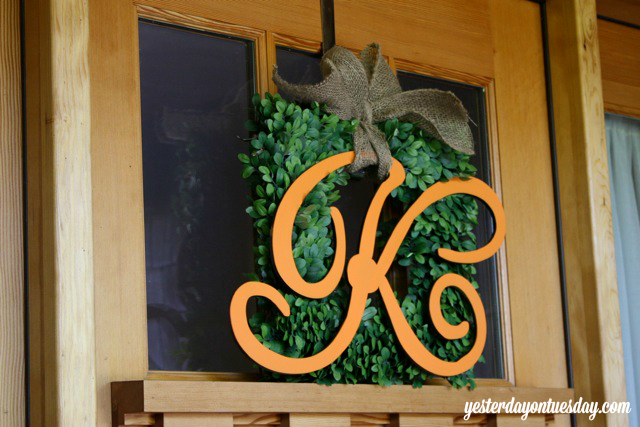 I painted the wooden letter orange and used burlap to fasten it to the wreath. I love that it looks modern and traditional at the same time. 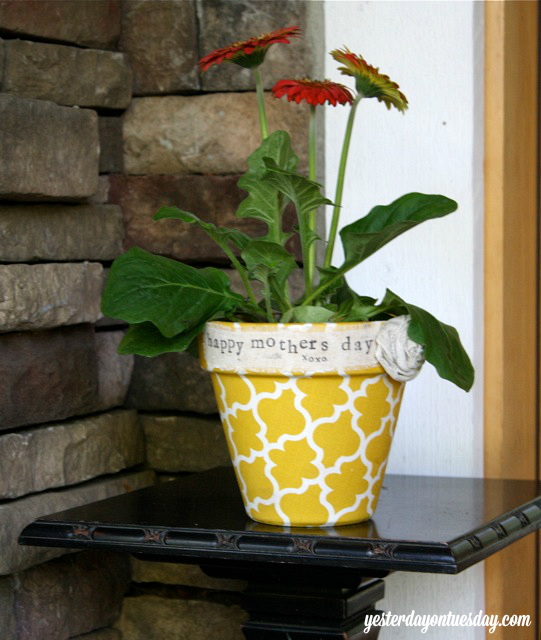 To continue the citrus hues, I also purchased a Mother’s Day fabric covered flower pot from the Etsy shop Flowers in December. They have lots of cool personalized things to check out. The pattern is so neat. 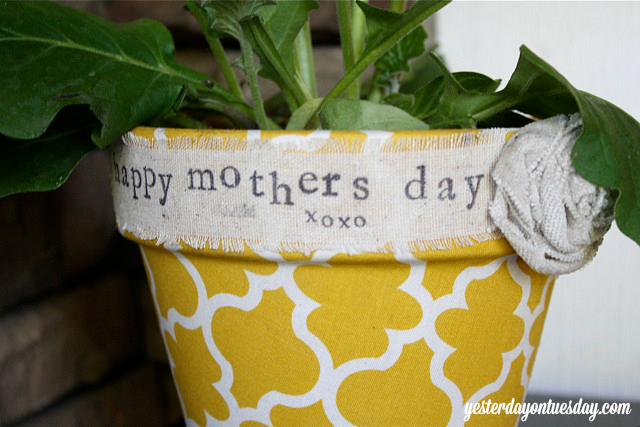 And I like the hand stamped “Happy Mother’s Day” and the flower. In the spring and summer we like to sit in front of our house and visit. The bench and cushion were fine, but were missing something: pillows! 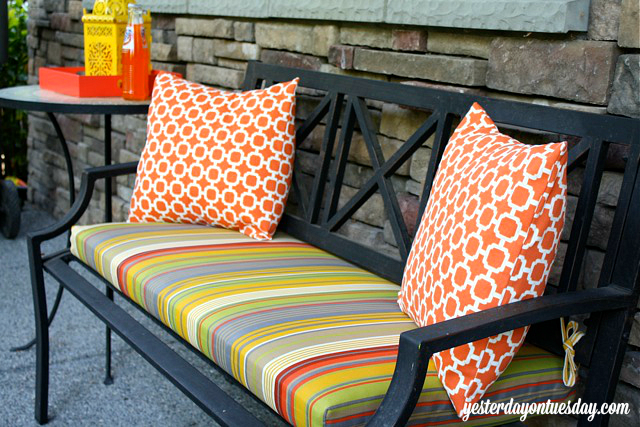 I liked the “Hockley” pattern of these two pillows from a shop called Simply Divine by Joann on Etsy. Don’t the pillows “make” the space? With all these bright colors, I wanted to update my planter as well. Here’s a larger view of most of the area. 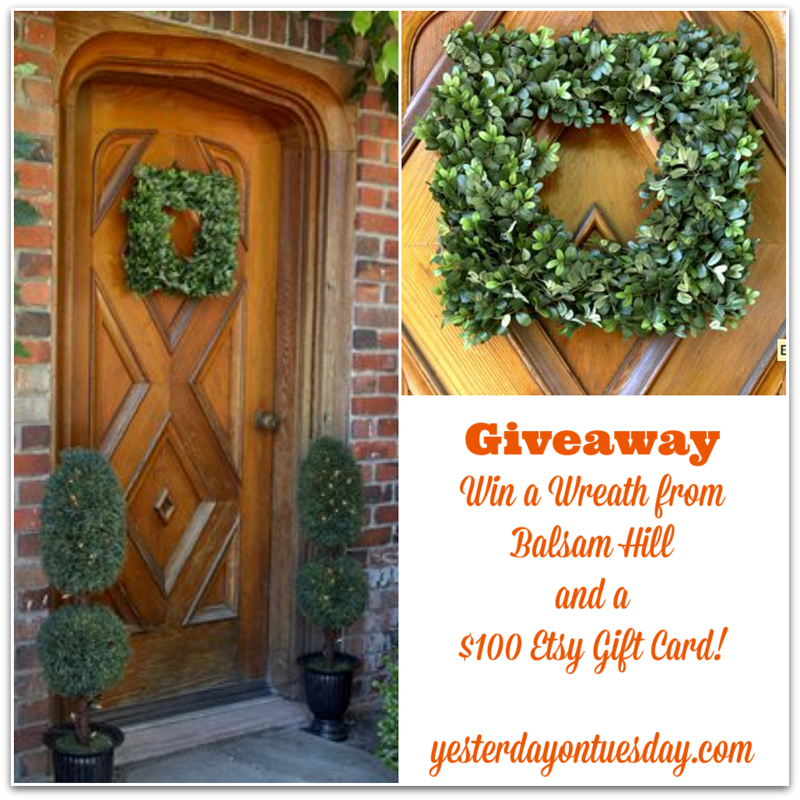 You can win your very own Balsam Hill English Boxwood Wreath PLUS a $100 gift card to spend at Etsy! To enter, leave me a comment telling me the best advice (decorating or otherwise) that your Mom gave you. I’ll choose a random winner at 5pm Pacific Time on Thursday May 15th. US Entries only please. Special thanks to Balsam Hill. My mother has passed, but the best advice I remember, that makes me smile now as I pass it down to my kids, is always like the batter spoon when you make a cake! Always put a smile on no matter what when you get your picture taken. “Always be true to yourself.” Pretty sure you can apply that not only to life in general, but in your home decorating and styling as well. The best advice my mom ever gave me was if a robber ever gets in the car with you get out. Not earth shattering but smart. My mother told me that fresh vegtables are the best and taste better than canned or even frozen. My Mom’s best advice was never pay full price for anything. One thing that she said that stands out is when your house needs cleaning and the kids want attention, don’t worry about the housework. It will always be there but your kids will only be little for a while! My Mother had a very eclectic style and so do I. She always said if you like it that is all that matters. You will find a place for the things you like. She also said not to worry if others like your taste they don’t live there. We both have moves many times in our lives and are most comfortable when we have our things with us! I lost my Mother two years ago and now I have many of her things around me. It makes me soooo happy to see her items in my home! My mom used to say always wear clean underwear. Never know when you will be in an accident. Regarding decorating, though, I learned to use quilts on our beds. They give such a homey atmosphere. My mom is a wealth of awesome knowledge! Probably the best advice she gave me was teaching me that you feed the animals first, THEN yourself. We lived on a farm and it was always straight out to the barns to care for the animals before breakfast! You learn to care for others before yourself and how important other lives are, more important than your own comfort at times. My Mom told me to “Never say Never” It works for lots of things! My mom always told me to never pay full price for anything. The best advice my mother has given me was that good things come to those who wait. Patience was such a hard virtue to learn– but she was right! The best piece of advise my mom ever gave me was how to look for the best deals! My mom gives the best advice by not giving advice. She has this amazing talent for guiding without leading, and she always manages to point me in the right direction. It’s a fantastic gift as an adult having my second child! The best advise I got was to work hard first then enjoy the rest of your time. My mom told me to take more chances/be bolder and put up more photos. I most recently painted one of my living wall rooms dark brown then used really large black matted frames with black and white photos of the day I had my son. My mother is a great decorator and her best advice is to go to plenty garage sales and use plenty of coupons, She was a bargain shopper and everything she made looked GORGEOUS!! The best advice my mom gave me was to be proud of getting a bargain at the thrift store. My mother’s best advice was for me to have kids! My mom taught me to always look on the bright side of a situation. It’s simple advice but it has served me so well! The best advice I got was to decorate your living space to relax, enlighten, and make you happy, not to impress. After all, you will be spending the most time there. “Find something you love to do and then find a way to get paid to do it.” I think this is a quote she heard somewhere else, but my mommy told it to me all the time. It inspired me to become a high school teacher in a field that isn’t as easy to find a job in – theater/public speaking. I do love it though, and it’s opened a lot of doors for me. I think I’m going to drill this into my daughter as she grows up. enjoy the chaos – it doesnt last forever. It was to get a good education and always be merciiful to others. Always keep it simple and personal. and don’t be afraid of what it looks like. Which sounds like bad decorating advice but the 3 year old artwork means more to me than a Picasso would! The best advice I received from my mom is how to coupon and shop clearance racks. She is a pro at it, and I have become one as well! The other advice may not be exactly appropriate, but funny. My mom’s first marriage was loveless and ended badly. She claims it was because they never really dated, but just rushed into it. She always told my sisters and I to really get to “know” a man before marriage, because you wouldn’t test drive a car before buying it would you? My mom passed away when I was 12, but she always taught me to be nice to everyone. Not just my friends, but everyone. The best advice I’ve gotten from my mom is to be smart with my money. My mom taught me the value of being kind and having good manners. She also taught me how to make a house a home. My best advice from my mom is to always look for the positive in everything I do! To find my own happiness, and everything will fall into place. My mom isn’t much of a decorator, to be honest. But she did teach me the importance of having a comfortable, kid-friendly home. One of the best pieces of advice from my mom was “don’t take it personally.” It has certainly served me well in many situations. My mom took care of her mom for the last 8 years. It wasn’t spoken advice, it was true lead by example advice. Everyone deserves to be honored, to be cared for, and to do so with a willing heart. She always said Try your best when I am in tough situations. My mother always said a clean kitchen sink each night will make you feel better in the morning. Isn’t that the truth. It’s a pain to wake up knowing you have to do the dishes. My mom isn’t much of a decorator, but she definitely influenced me by her fondness for antiques and the way that she always had beautifully framed photos of our ancestors around the house. Mom always decorated with items that had meaning to her, items that had been passed down to her from her parents. So that’s what I do, and it brings me joy! My mom always said, “PMA” – Positive Mental Attitude. She’s right – it always helps! My mother was killed by a drunk driver when I was only 5 years old. She never had the opportunity to give me advice when she was alive, but her death taught me a lot. I learned at a very young age that your actions affect other people, not just you. Always consider the outcome of your actions and make responsible choices. Love those around you with every fiber of your being and make sure they know it. When you lose someone you love make sure they live on – do good deeds in their memory, share their stories, and think of them often. My mom is not a big decorator but some great advice she gave me is to make time to do something for yourself. My Mom always told me that no matter where I live, I can make it nice with a fresh coat of paint, some rugs and pilows, and a lot of personal touches. She was right. Whenever I get stressed about things, my mom always tells me that it’s temporary. That used to annoy me when I was younger but now when I’m older I totally get it – things really change all the time. If you can’t say something nice, then don’t say anything at all. Very pretty, I love all the bright colors! The best advice my mom gave me was treat others the way you want to be treated. Always be kind. I plan on teaching the same to my son! The best advice I got was “more is less”. My mom always told me traditional doesn’t go out of style and usually less is more for decorating! Her advice that I still go by: If someone doesn’t have a smile, give them one of yours. Sometimes you just need to be quiet! My mom taught me to have decorations that reflect the seasons and swap them out regularly to keep things fresh! My mom and I have different tastes, but I do remember her telling me that everything doesn’t have to be matchy matchy! She taught me to always be joyful and forgive! My mom’s advice came through her way of living…be frugal, look for a good deal, be simple in your decorations. I’d say the best decorating advice my mom taught me was to bring the outdoors in! We are outdoorsy people and she believes that surrounding ourselves with nature brings us emotional peace! I agree! My mom really taught us the importance of saving money. I am so frugal thanks to her – I’m so thankful for her money saving tips! The best advice my mom gave me after I got married was to be myself when it came to trying to impress the in-laws. Otherwise I’ll be tired for the rest of my life trying to maintain that image! The best advice my mom ever gave me was to always go out of the house presentable and decent looking. This is important because you always want to feel good about yourself to be your best. The best mom advice I got was to decorate for myself and not anyone else. If my home makes my family and me happy, that’s what counts, even if it isn’t on trend. My favorite decorating advice my mom ever told me which has been a few, has to be that adding plants to a corner can really soften up a empty space and adds life at the same time. My mom always had a tall, unique tree in the corner of the living-room in the houses I grew up in. The best advise my mother gave me is when I was having marital issues and she told me she did not want me to tell her everything that was going on to avoid her forming opinions that may carry on through my life to which she was correct. If you want something, don’t ever give up on it. That advice has served me so well in life. The best advice my Mom ever gave me was to be patient with my child. the best advice she told me is to never let drapes stop at the window seals, let them hit the floor. My mom always said to just make it yours, your house should reflect your family. My Mom always kept everything neat and organized so I learned to keep certain papers in one drawer or purse pocket so they don’t get lost. And have everything face forward, it looks nicer. My mother always taught me the importance of keeping the arrangement of a room conducive to conversation. Placement of chairs and couches is important, just like making your guests feel engaged in conversation instead of awkwardly talking across the room at each other is important. My mom taught me never to go through things alone. Whatever the problem/issue may be, it is always less scary when someone can help you. I am teaching my kids the same thing. It’s always nice to know you are not alone…and sometimes talking to someone else will make things a lot better. The best advice my mother gave me is to never get up. If you want something you work hard and keep trying until you achieve your goal! My Mom is FABULOUS when it comes to well, everything, but really her sense of style. She knows how to make any party or holiday feel festive through decorating. I have the fondest memories of how special each holiday was at our home. I’m not sure that she has given me any advice, but she has taught and inspired me simply by showing me. I heart her!!! The best decorating advice my Mom gave me was to repurpose and reuse what you already have. The best advice my mom gave me was not to be afraid of color on the walls. Now I can’t stand white walls! my mom taught me how to yard sale and save money on almost everything! She told me to stay close to God. My mom always told me not to be afraid of color! The best advice my mom gave me decor wise was to re-purpose and re-use things in different ways. I intentionally seek things out now I can do that with. Mom told me to pick out your solid color scheme you like best then co-ordinate it with patterns that you could mix and match to change up the look. Don’t talk to strangers??? IDK. I don’t remember my mom giving much “advice”. Thanks. My mom passed on to me family recipes and a love for cooking. My mom taught me that when it comes to decorating even the strangest things can be made into decoration. She once gave me a newspaper and cardboard told me that this is all she would give me to decorate my play room. I credit her for my craftiness I used it to make cardboard lettering covered in the neat looking parts of the newspapers. My mom always tells me that when decorating use bright colors. Her living room is a deep rich red. I love it! Also include lots of family photos! kristiedonelson(at)gmail(dot)com Thank you. My mom taught me to aways do my best & to respect myself! My mom taught me to that it didn’t matter what other people think – as long as you are happy! My mom didn’t do a lot of decorating. She does tell me not to buy anything that I can make, because not only will I be able to personalize it, but I can make it myself, cheaper, also… Thrift shopping! Don’t listen to people who tell you what to do. Listen to people who tell you stories about their experience and leave it up to you to decide what to do. My mom has always done two things: decorate with items she loves, and never pay full price for anything, whether it’s furniture or a candle! My moms best advice was to never pay full price for anything. My mom would always tell me when I was lamenting my three small boys fighting all the time, that I shouldn’t sweat the small stuff. She would say they grow so fast, and that someday I would miss them being little. How right she was! They are grown now and I’d give anything to go back to those harried days. My mother told me that you can make it through anything if you take it one day at a time. My mom’s best decorating advice is to go with neutrals. You can always add pops of color later. My mother never had much interest in decorating – books were her passion and she would always choose reading over sewing new curtains or rearranging furniture. To that end, her best advice was “less is more”. She always said the more you had, the more you had to clean and dust. She was a minimalist long before it was en vogue! My mom always tells me not to judge. It’s a simple idea, but it’s hard to sometimes put this into practice. So being reminded is always nice. My mother has passed, and I remember her saying.. decorate to your heart desire. If you are happy with the results then use it. My mom’s best advice…..vacuum when company is coming over! ha! The best advice my Mom ever gave me was to never sell myself short. The best advise my mom every gave me about decorating was to ignore the magazines and the ‘rules. Just buy a few pieces you like and then decorate around them in a way that works for you. The best advice my mom ever gave me was to tell me that the housework can wait, to spend the time with the kids because they won’t be little for long. My mom always said, it doesn’t matter what people think, if you like it that’s perfectly acceptable! It’s your space! Always try to be positive (glass half full) is something from my Mom! The best advice she gave me was to do what you like but do it timeless. Trends may be cute but they change! My mom taught me to enjoy learning. My mom always told me to treat others the way I want to be treated. Decorating wise, my mom always taught me to only buy what I really love and not just settle for stuff because i want my home to look finished. Best and truthful advice my Mother gave me was “The truth will come out in the end” and she was SOOOO right!! The best advice my mom ever gave me was not to judge others because you never know their full story. The best advice my mother ever gave me was to remember that my kids will only be little for a short time and to enjoy every minute. She was so right. Best advice, kids grow like weeds, enjoy them while you can! Best advice from my mother is probably to spend time on the things you find most important in life, and not worry about the little things. Best advice my mom gave me regarding decorating was “Keep It Simple Stupid”. The best advice was to never give up, no matter how hard. If you give up, it can only get worse. my moms best advice was love people no matter the color of their skin. something i proudly teach my dd. always keep it fresh, ie, rearrange often! My mothers best advice was to FINISH SCHOOL! I cannot thank her enough for always pushing me to further my education! My mom told me not to listen to her or anyone else – to trust my instincts! My mom’s advice was to shop at thrift stores for lightly used furniture. Decorate to fit your life, nice and cozy. Treat people the way you would like to be treated. Also – if you don’t have something nice to say then don’t say anything at all. The best decorating advice my mom gave me is to only put things in my house that are useful or are beautiful to me. Mom’s best advice: Never judge anyone by their outward appearance- whether nice or shabby because it is what’s on the inside that matters. The best advice Mom gave to me was to treat other people the same as I would like to be treated. It always makes me think of how I would feel, if the shoe was on the other foot. She died on Mother’s Day a number of years ago. She was a great Mom! Of all the advice I received down through the years from my mother, I believe the most important was to always keep learning. She told me to never let a day pass without reading something and trying to broaden my mind. My mom always told me no matter what happens in life, “shake it off” and keep moving forward. The best advice was to always use solid, basic colors. My mom taught me to buy quality over quantity. The best advice my mother ever gave is a saying she has said to my siblings and I… “This too shall pass”… i have now passed that down to my daughter. My mom is a wonderful artist and she has such an eye for decorating. I just let her decorate my place and it always looks like a showroom when she is done! I think it would be to always be minimal and not cluttered, and always keep the most meaningful pieces. My mom always said “Who cares if it matches, as long as you love it!”. My mother says everything has it place and everything in its place. One of my mom’s best advice was to not take things personally. Just be the best person I can be and the rest is out of my control. General advice my mom gave me is to think of the good times coming up when you are nervous or just don’t want to do something NOW. My mother’s best advice was to always strive to be faithful and loving in every area of life. The advice my Mom gave to me was to not get furniture that I would get really upset about if the kids or pets messed it up. Teach them to respect their surroundings, but don’t be a fanatic about it. Some of the best advice my mother gave me was to always help others no matter how little you have to give. She also always told us to make a living doing something we enjoyed even if it wasn’t the highest paying career. She’d always say money isn’t everything you know. My Mom always said if you like it then go for it. Don’t be so uptight about decorations that you can’t enjoy your home. My mother passed away 6 years ago and was never a decorator but what she did put on her walls were things that were given to her in love and she loved it all. My mother always told me that happiness should come before money. It is very true. My family may not have a lot, but I have never been happier. We are wealthy in other ways. My mom has given me so much wonderful advice, I don’t think I have a favorite since it has all been helpful and encouraging. I think the most relevant piece of advice in my life right now has been to live for the moment and not to worry about the housework and small things, they can wait. I have two small children who are growing quickly and I am enjoying spending every moment with them! the best advice my mother has given me is to only keep those in your life who deserve to be there. My mother told me to “use what you have got” but now we call it recycling or repurposing. An old bureau can become a beauty station with a little paint and the addition of a mirror. 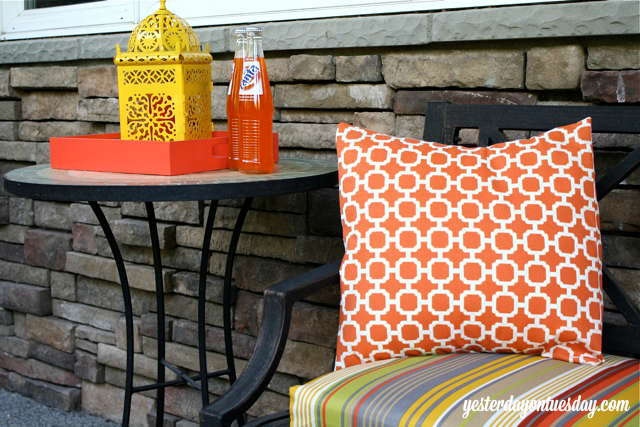 If your pillows don’t match your new sofa, take an old dress with a color and pattern that does and make a new pillow case. I love the letter on the wreath! So cute! My mother always said less is more sometimes. but my granny also said more was better. My mother also always said go with a theme in your kitchen something like apples or grapes and granny said nick nacks are a must! the best advice my mother has given me is to only keep those in your life who deserve to be there. i have taken that very much to heart. My mom and I are both kind of designed challenge, but she did tell me once that odd numbers are more aesthetically pleasing. Simple can be beautiful. My mom was right! Lots of great advice……one of the most memorable was when I was a kid and she told me to never wear pink and red at the same time. KISS- Keep it sweet and Simple! My mom always said to keep it simple and clean looking! My Mom always gave the advice that it is better to take your time and pick out a focal piece to decorate a room even if it is expensive instead to buying lots of things that look cluttered, thrown together and end up costing more. The best advice: Momma told me there would be days like this. She always told me to have FUN with my style, If I make my house bright and fun.. I will feel happy everytime I look at everything I’ve created. Mom’s best advice was flowers always dress up a room. My Mom’s advice was to choose several coordinating colors and use those for a room’s color palette. I have done this through my house and it really works well! It’s better to have a house where people feel comfortable than one that is perfect. My mom always said don’t have to much clutter! Clutter is messy looking! The best decorating advice my mom gave me, or the thing I remember is to make one colors “main color” the accent color of the room next to it. So if the walls in one room are painted red maybe have red pillows in the next room especially if the rooms are next to each other. The best advice my mom ever gave me was – Be like a duck, and just let all the bad things wash over you and away. The best decorating advice that I received is to take measurements before you buy all of your furniture. That way you don’t end up with a couch or bed that takes up way too much space. Good advice. She always told me to never be afraid to add a boost of color..and to place “knickkacks in threes” on display. My mom has always told me that if I want to do something, do it 100% because if I do that I can’t not succeed. When you’re feeling overwhelmed, set a 15 minute timer, clean any/everything you touch, and stop when the timer stops.